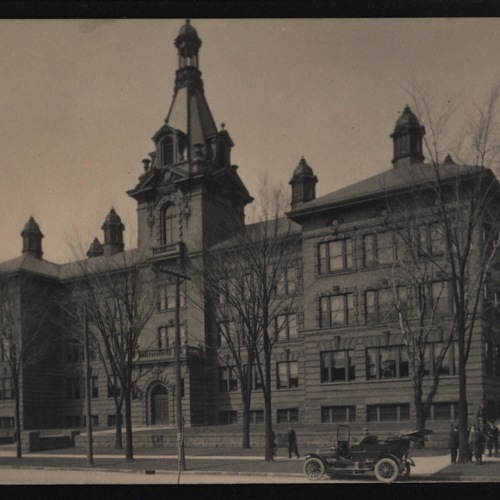 This collection consists of photographs of Buffalo Public School buildings taken in March 1908. These 83 black & white platinum prints were originally mounted on black pages in an album. 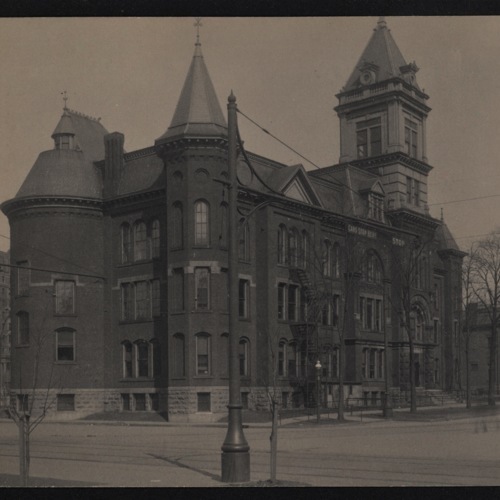 While the album is no longer intact, information noted on the photographs reveals they were produced for a building survey for the Buffalo Common Council. The Deputy Building Commissioner of the Department of Public Works wrote a report on the condition of the school buildings and submitted it to the Common Council in 1908. The report paid particular attention to doors and fire escapes, and recommended safety improvements. Many of the photographs show the back or sides of the schools in order to document the fire escape(s). “Condemned” is written on some of the photos, but this may have been added at a later time. 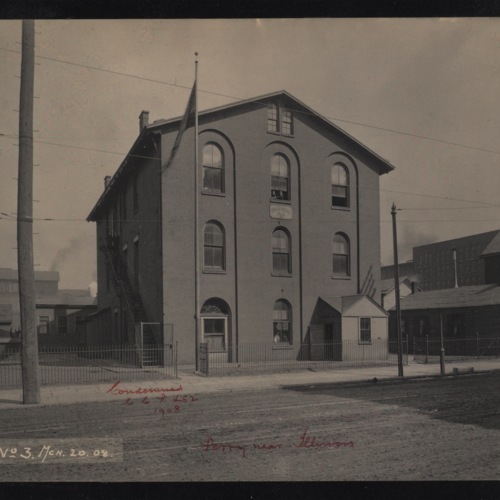 While the majority of the buildings documented here no longer exist today, most were still in use for many years after the photographs were taken. In 1908, the Buffalo Public School System consisted of 62 primary schools, 3 high schools, and one public teacher’s college. Nine of the primary schools are no longer in this collection, lost before the photographs were acquired by the B&ECPL. 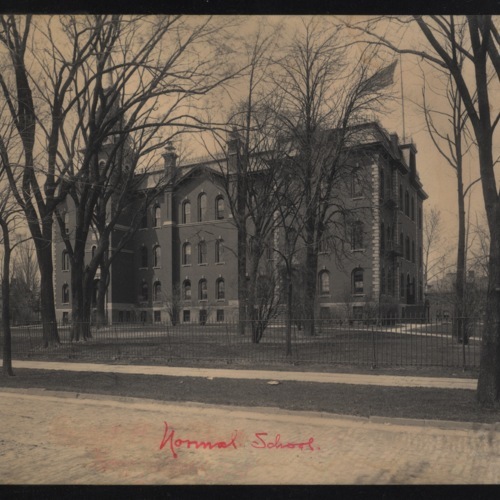 Many of the buildings in use in 1908 were erected between 1880 and 1900, a period of heavy construction when student enrollment almost doubled. Often the schools pictured are actually the second or third building to serve the neighborhood. The school system was organized in 1838, and the original buildings were small wood schoolhouses. As Buffalo’s population grew with the annexation of Black Rock in 1853, and the influx of immigrants in the second half of the 19th century, there was a need for larger schools, and more districts to handle the increase in students. 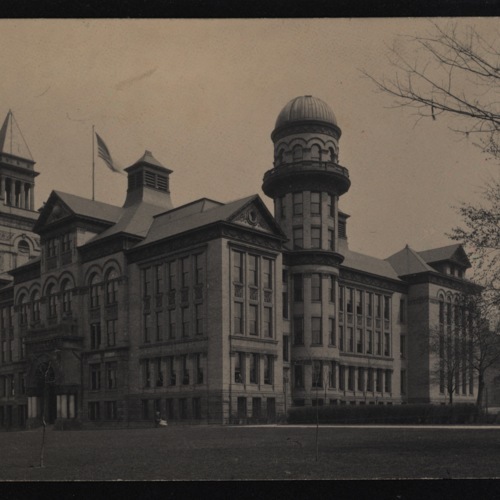 As most of the buildings in these photographs no longer exist, this collection is a snapshot of educational architecture in the early 20th century. 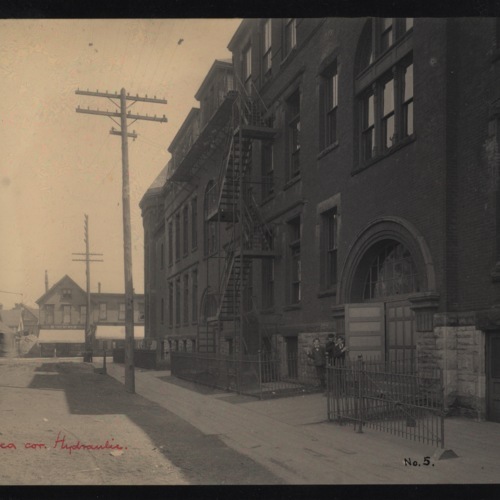 And while the schools are the main subjects of each photo, we also see a glimpse of life in 1908 Buffalo -- neighborhood shops, unpaved and brick roads, trolley car lines, early automobiles, and horse-drawn wagons. Some students took the opportunity to have their picture taken, and are lined up outside for the photographer. Others can be spotted peering out of the windows, curious faces against the glass. 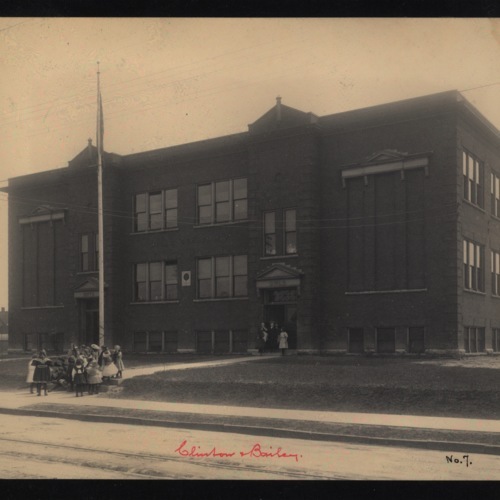 Some of the primary schools were designed by the architectural firm of Louise Bethune, the first professional female architect in the United States. 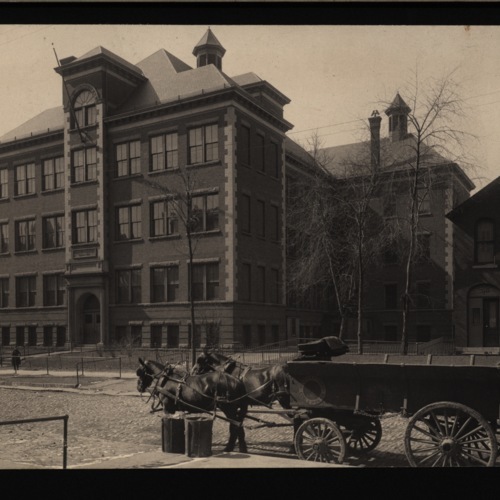 She and/or her husband, Robert A. Bethune, designed six of the schools in the collection. Other notable architects of these schools include Esenwein & Johnson, M.E. Beebe & Son, and Charles D. Swan. Buffalo Common Council Proceedings, 1908, pages 447-453. 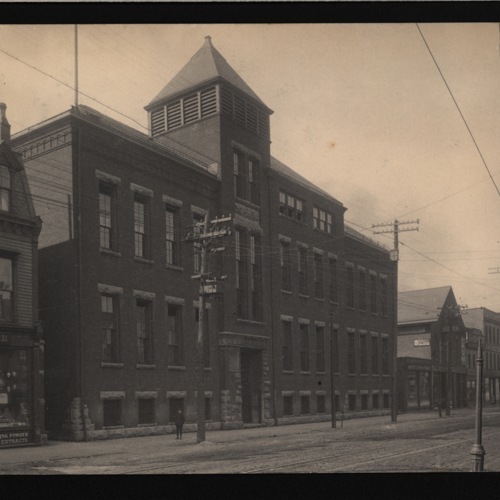 Built in 1890, this steam-heated building was located at 789 Seneca Street at the corner of Hydraulic Street. In 1905, it was renamed Seneca Vocational School. The school was in use under various names until 1955 and later torn down. Located at 248 South Division Street, this 1868 building was used as a primary grade school until 1954. The school has since been demolished. 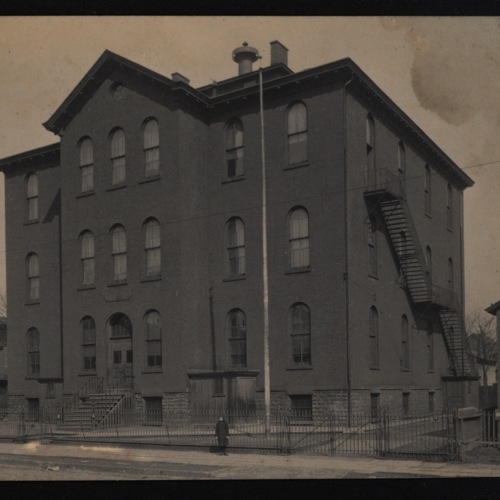 The first image shows the school located at 649 Bailey Avenue near Clinton Street. Built in 1891, it operated as School 7 until 1922 and was an annex to various other schools until 1950.